For many, the escalation seems incredible, or — for right-wing social media trolls who have grown mistrustful of the state — even implausible. Members of a far-right “vigilante” group arrested in Chemnitz in mid-September for breaching the peace were arraigned this week on suspicion of forming a terrorist organization calling itself Revolution Chemnitz. Prosecutors’ spokesperson Frauke Köhler said on Monday that Revolution Chemnitz had been planning an attack on foreigners and “people with differing political views” on October 3, Germany’s Unity Day holiday. Indeed, Köhler said, there was evidence that the mid-September incident had been a “practice run” for October 3, which suggested that the authorities had swooped in just in time. “The communications showed that the suspects had already tried intensively to acquire firearms,” Köhler said, though police had “only” seized a collection of batons and an air rifle during Monday morning’s raids. The group had wielded weighted knuckle gloves and an electroshock weapon in the September attack, when one person was injured. 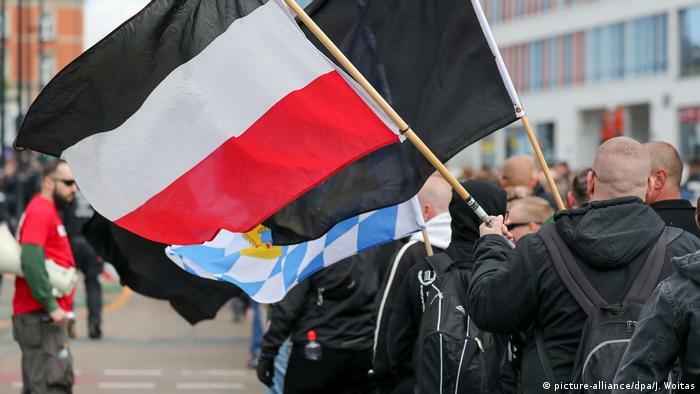 The prosecutor’s reaction appeared to show that Germany’s security authorities are beginning to reassess the threat posed by the country’s neo-Nazi subculture. To justify why Revolution Chemnitz should be considered a terrorist organization, rather than merely a gang of vigilante criminals, the federal prosecutors’ statement mentioned that the communications showed the group’s aim was “the overthrow of the democratic rule of law” based on their right-wing extremist ideology. Little is officially known about Revolution Chemnitz other than what was in Monday’s two-page statement: They were all German men aged between 20 and 31, and they were all members of the “hooligan, skinhead, and neo-Nazi scene” in the Chemnitz area. They were also formed very recently — at the latest on September 11 — which suggests the group sprang up in the aftermath of the killing of a German-Cuban man in late August, when Chemnitz saw a series of far-right demos and counterdemos and a huge anti-racism rock concert. “The events in Chemnitz appear to have been a trigger — that this was the time to mount an attack,” said Florian Hartleb, political scientist and specialist in the effects of populism.